Worthington, Ohio---The Shell Rotella Cup now tours 10 events and rewards all 13 divisions on the NTPA’s Grand National circuit. And presenting sponsor O’Reilly Auto Parts will provide competitors with an extra incentive to burn it in at the end of each and every run. The Official Auto Parts Store of the NTPA, O’Reilly will present a $100 gift card at each Cup event to each Cup-competing division’s “Hardest-Working Puller,” defined as the competitor whose GN-registered vehicle posts the greatest total credited distance over the course of its division’s appearances. (Primary-round distances are capped at the maximum track length, while pull-off distances are unlimited.) Total “Hardest-Working Puller” rewards will approach $5,000 on the season. “It’s a much appreciated bonus, and it gives our fans and pullers yet another dimension to follow during this expanded Shell Rotella Cup series,” stated Gregg Randall, NTPA General Manager. 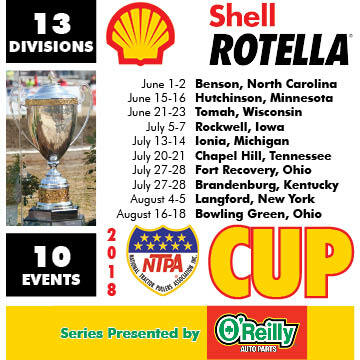 2018 Shell Rotella Cup events include Benson, North Carolina; Hutchinson, Minnesota; Tomah, Wisconsin; Rockwell, Iowa; Ionia, Michigan; Chapel Hill, Tennessee; Fort Recovery, Ohio; Brandenburg, Kentucky; Langford, New York; and Bowling Green, Ohio.